Size: 49 x 58 cms. 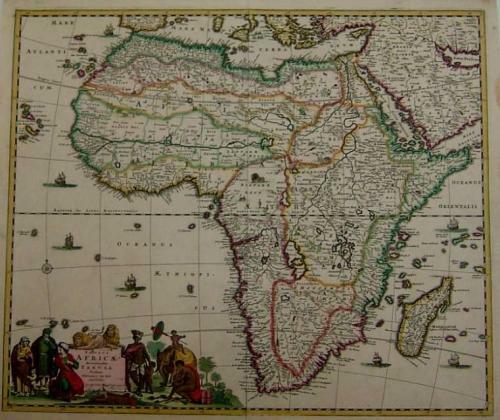 Title: 'Totius Africae Accuratissima Tabula '. A fine example of a decorative late seventeenth century Dutch map, finely engraved by Frederick De Wit. The map is very detailed with a comprehensive network of waterways and mountains and so on - mostly fictitious. There are numerous place-names along the coasts and in the interior where lions, elephants and other creatures are shown. The map is in good condition with a 15 cm lower centerfold restoration and several small chips in the margin well away from the engraved area.